We are proud of the setting and unique design of our facility. This premier Grand Island dental facility was constructed in 2004 and had interior design updates in 2015. There are tall, wide windows in our reception area that provide us with lots of natural light. We have a wheelchair accessible restroom right near our reception desk. 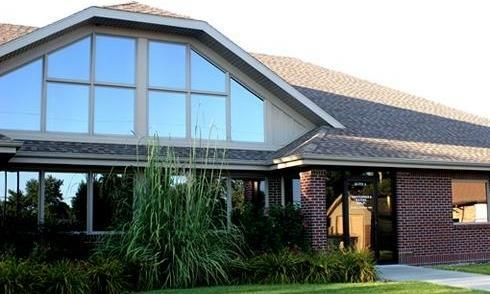 Our five treatment rooms have comfortable dental chairs and large windows that look out over a scenic pond. The colors of the interior are inspired by our view. Patients appreciate the relaxing scene and enjoy watching the neighboring animals and birds. Over the years, patients and staff alike have been intrigued by baby ducks, bald eagles, a blue heron, a turtle laying eggs and the beautiful change of seasons in Nebraska.